Men's sportswear with cool Graffiti print. DO YOU WANT TO ATTACK THE GYM WITH YOUR OUTFIT AND THERE ARE SOMETHING ELSE THAN THE REST OF YOUR MEDESPORTERS? SHOP YOUR SPORTS ENTRANCE WITH COMFORTABLE ELASTIC BAND AND ENJOY A FINE FIT. BY HIGH-QUALITY MAX STRETCH MATERIAL, THE LEGGING IS, moreover, NOT TRANSPARENT WHEN THE DUST DRAINS. ALL SPORTS CLOTHES ARE PROVIDED WITH CONTINUOUS GRAFFITI ARTWORKS. THANKS TO THE COMBINATION OF 10% ELASTAN AND 90% COOL DOWN POLYAMIDE THE SPORTS CLOTHING IS SUITABLE FOR CROSSFIT, POWER TRAINING, BROGA, RUNNING OR SPINNING BUT ALSO FOR YOUR FITNESS WORKOUT OR INTENSIVE LESSON BOXING. THANKS TO THE COOLDOWN POLYAMIDE MATERIAL, YOU HAVE THE PERFECT MOISTURE AND YOU DO NOT GET HOT, IT FEELS EVEN FRESH! 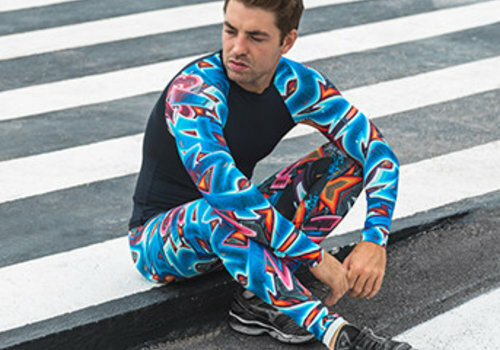 VIEW OUR UNIQUE GRAFFITIBEASTS COLLECTION IN OUR WEBSHOP AND ENJOY YOUR FAVORITE 'FITNESS FROM THE STREETS' SPORTSWEAR. ARE YOU KNOWN WHAT ARTIST IS YOUR FAVORITE CLOTHING KIT? CHECK OUT ALL GRAFFITI ARTISTS ON OUR SPECIAL PAGE WHERE WE LOOK FOR THE ARTISTS; GRAFFITI ARTISTS. SHOP YOUR FAVORITE SPORTS SET AND EXPERIENCE THE QUALITY. UNSATISFIED? WITH GRAFFITIBEASTS, YOU HAVE ONE YEAR LONG WARRANTY ON THE SUBSTANCE, NADS AND PRINT AND WE PURSUE A 100% SATISFACTION WITH OUR CLIENTS. WASHING INSTRUCTIONS: ALL GRAFFITIBEASTS SPORTSWEAR CAN BE WASHED ON 30 DEGREES IN THE WASHING MACHINE. THROUGH THE USE OF HIGH-QUALITY AND QUALITATIVE MATERIAL, THE CLOTHING IS NOT SUITABLE FOR THE DRYER. .